13" H x 15" W x 13" D, overall height 62"
David Nosanchuk is an inspired American artist based in New York City. Within all of Nosanchuk’s work, the fusing of subject, technology, and craft provide a narrative that is visually and emotionally layered, forging an ongoing dialogue over space and time. His early studies at the Cranbrook Academy, Michigan’s historic arts community, embedded into Nosanchuk the methods and traditions of modern design that continue to inform his process. Nosanchuk earned a degree in Art History at University of Michigan, moving to Los Angeles shortly thereafter to pursue a Masters of Architecture at Southern California Institute of Architecture (SCIArc.) In Los Angeles, Nosanchuk became a master woodworker-designing and constructing furniture, and eventually teaching furniture fabrication. 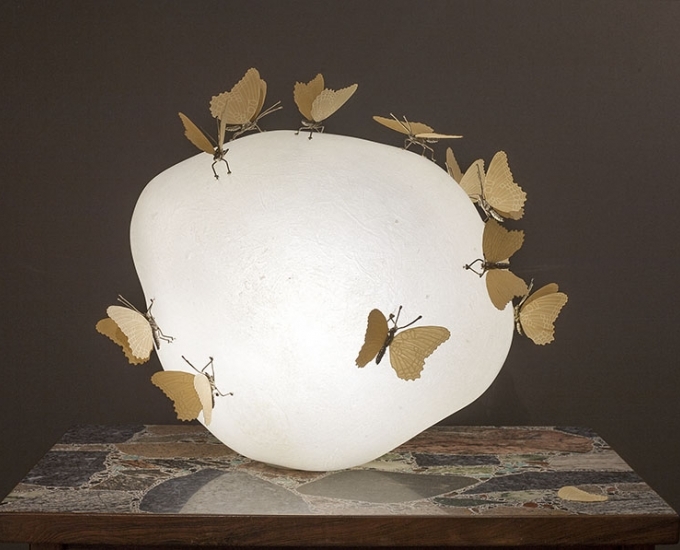 In 2000, Nosanchuk launched his first furniture and lighting collection at the International Contemporary Furniture Fair. In 2012, an iteration of the lamp was permanently installed on the Cranbrook campus, where Nosanchuk has been commissioned to design more unique decorative elements. His current work has been shown and collected in museums including the Triennale di Milano, Les Arts Decoratifs in Paris, the Cooper Hewitt, the Museum of the City of New York and the Museum of Arts and Design in New York. His 3D Printed Lamp, “Louie” was the installed in a series in last summer’s Italian Olympic Pavilion.